The back alleys and blank walls of Charlotte are calling. Church and College Streets are invisible with their bare facades, blank walls, and empty spaces that dot the streetscape. Utility in feeling, Church and College take a back-seat to Tryon, even though they are only one-block off. Sure, Trade and Tryon can be the “most memorable streets” as per city of Charlotte wishes, but we should pay attention to all of our city surfaces. Why don’t we care? Why don’t we notice? 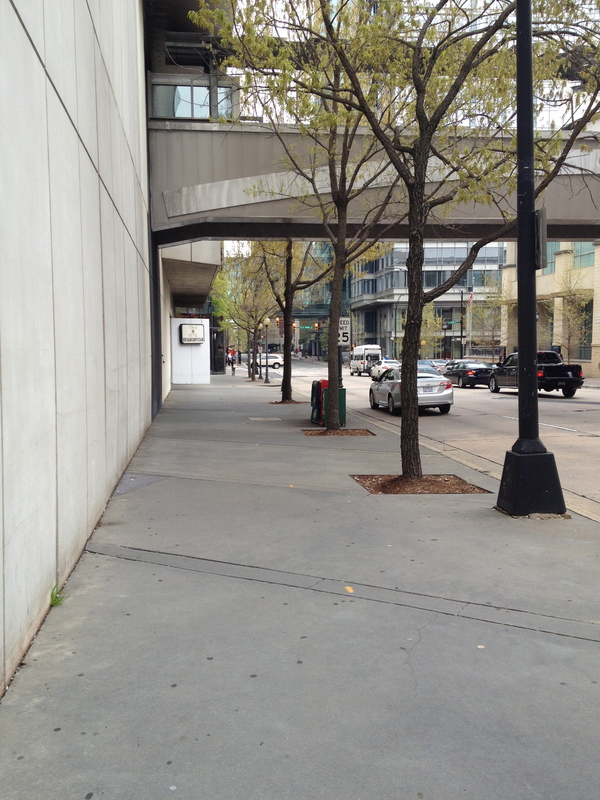 In the density of Uptown, these spaces are valuable both economically and culturally to the cityscape. The city walls have the potential to hold the cultural story and experiences of its people. Right now they are vacant and lifeless. We are missing opportunities to capture the soul of the city. The potential for experience and memories are lost. The city streets should make an impact, but they don’t. Let’s program to make an impact, with the blank walls the canvas. 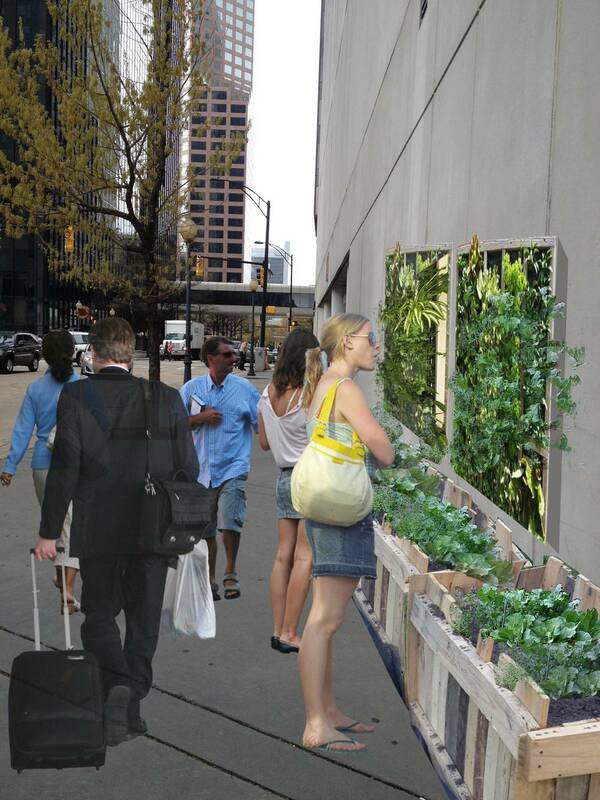 The images represent an investigative study done by Keihly Moore about challenges and possible solutions for the walls of College Street. Movies: Why not add a little cultural programming to Charlotte's streets and design more reasons to come into town? We should be taking advantage of our resources! This movie could be projected from the second floor of EpiCentre to the enjoyment of so many viewers. 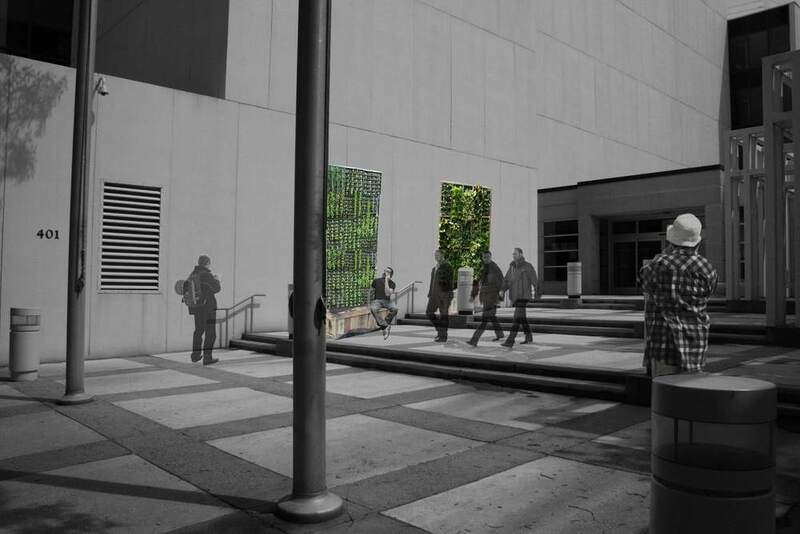 Granted, this would activate the wall during the night, we'd have to think of a similar, low impact project for the daylight hours. What about green on grey? What about a softer texture that changes colors? What about something you can eat? What about something that can start conversations between strangers? Engaging in discussion: How about a staging of some people who are just as interested in engaging people? There could be a "spoken word" event of sorts, with people lining up, all asking the same thing, on repeat. What kind of reaction will this get? Will it create a memory of passers-by? Will there be engagement? Shadows: What if we just traced the shadows from the light posts of the trees onto the adjacent blank wall (also on College Ave.)? It might make people wonder, or even make the connection for themselves...a permanent condition of the night reflections.....Just a different visual texture that may improve the environment just a bit. What if they just noticed their surroundings a bit more? What if they cared?